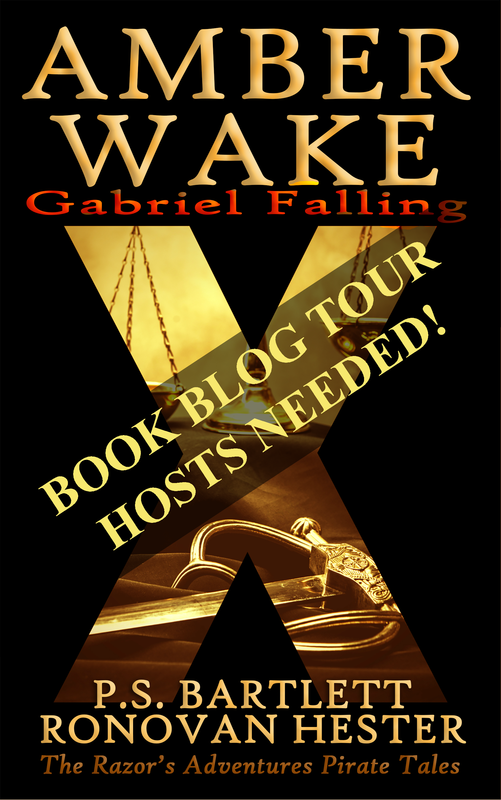 #BOOK #BLOG TOUR HOSTS NEEDED! My debut novel, Amber Wake: Gabriel Falling with @PSBartlett. I want to let all of you know my Historical Adventure debut novel Amber Wake: Gabriel Falling now has a release date of February 14, 2016. Yes, Valentine’s Day. P.S. Bartlett, my co-author, and I want things to be quality. We are not rushing things for a Christmas release. A wonderful day yes, but for our first collaboration, we want it to be done right. With that knowledge, I’ll be needing Book Blog Tour Hosts. You’ll be seeing information here on my blog leading up to the release date, but I need your help. The best way to sell a book is by word of mouth. My friends to tell their friends. One way to start that telling is by hosting a Book Tour. I will be preparing some posts you can share. Or if you are interested in sending me questions for an interview that would be great as well. If you’ll fill out the form below, that way I can keep easy track of who is willing and what they would like to do. I like keeping volunteers and the like more between the two of us rather than in comments, I hope you don’t mind. I have a few lined up already, but the more the merrier for my first ever book launch. I so want this to be an amazing experience. You have no idea what it’s like to have a book coming out only 2 years after suffering a concussion, losing the ability to talk, write, my memory, and so much more. Here are various Blog Topics you might look at to get an idea that I could write about if you are not interested in asking interview questions. There are also sites you can search for with various questions to ask an author. Some are serious, and some are goofy. Either way, when you combine them with information about the book, it’s one more place you share my work. If you like one of these topics, note it in the form below in the interview type area. How to Write by the Seat of Your Pants: Outline or No? How I developed a character history? If you want to help, please fill out the form. You can leave interest in the comments section below if you like.